Advocating for change in policies, practices, and procedures across the campus to be more equitable to LGBTQIA individuals. 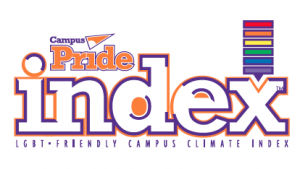 Augsburg University was named one of the “Top 30” LGBTQ-Friendly Campuses in 2018 by Campus Pride, as well as receiving a 5 out of 5 star rating. The index is used as a benchmark to look at various colleges’ and universities’ progress around making their institutions welcoming and inclusive to LGBTQIA+ -identified students. The index looks at a number of variables in its scoring, including LGBTQIA+ policy inclusion, support and institutional commitment, academic life, student life, housing, campus safety, counseling and health, and recruitment and retention efforts. For more information, contact Michael Grewe, Director of LGBTQIA+ Student Services, at grewe@augsburg.edu or 612-330-1499. You can also stop by our office in Christensen Center, Room 1C.